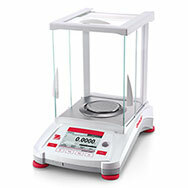 Performance, technology and ingenuity are all words that sum up the new Ohaus Adventurer series of analytical balances. These new Adventurer balances replace the legendary Ohaus Adventurer Pro series of analytical and precsion balances that were the mainstay of many laboratories all over the world. These new balances feature a 4.3 inch color touchscreen display that gives users easier access to settings and applications, no more navigating through obscure menu trees using the user manual and small LCD displays! Also, the Adventurer offers GLP/GMP compliance capabilities, two USB ports and an ingenious, space saving, modular draftshield doors. Performance is at the core of the new Ohaus Adventurer Series with stabilization times of 3 seconds or less and capacities up to 320 grams. Choose from 3 different capacities (120g, 220g, 320g) and internal or external calibration (/E models). Ohaus has outdone themselves and come out with a more than worthy replacement to the Adventurer Pro series and we are sure it will soon takes its place as the weighing workhorse in many laboratories throughout the world.